Sometime in the year 20XX, after numerous nuclear tests, the world became infested with giant monsters. To combat the threat, the Earth Defense Force (EDF) was formed. Part of this initiative included the development of advanced weaponry, revolving around maser technology. The other part was the formation of the M Institution, which trained human mutants to combat the creatures. Together, they were successful in pushing back the monster threat. However, on one occasion, the world saw a unified attack from the creatures. This included Rodan in New York, King Caesar in Okinawa and many others laying siege to the Earth simultaneously. 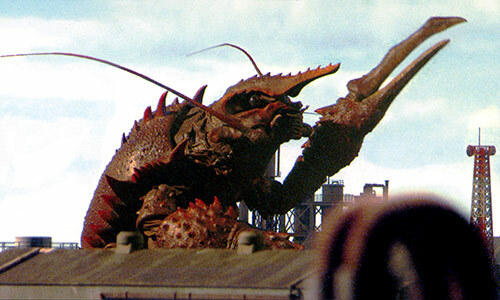 Among their rank was the giant crustacean Ebirah, who attacked an oil refinery just outside of Tokyo. The combined assault taxed the EDF's capabilities, but they tried to meet the threats as best they could. To combat the menace to Japan, Type 90 Tanks were dispatched. However, the sea monster made quick work of the tanks, using its giant Crisis Scissors claws to destroy the surrounding area, causing debris to crush the vehicles. Despite the setback, the EDF deployed a special squad of mutants to stop the colossal crustacean. Armed with advanced maser guns, the foot soldiers engaged their target. Performing acrobatic stunts, the troops managed to sever both of the monstrosity's claws. As they prepared to destroy the seismic shrimp's head, Ebirah suddenly disappeared in a flash of light. The Xiliens, a mysterious alien race from deep space, revealed that they were responsible for Ebirah's disappearance, along with a multitude of other monsters that were attacking major cities across the globe. The extraterrestrials' true intent was being masked, however, for it was the Xiliens who had actually released these creatures as a part of their plans for conquest. They did this through being able to control beings that featured M Base, among them both the world's monsters and the human mutants. When the true intentions of these beings came to light, though, the monsters were unleashed once more. This time, however, there was one creature on Earth who stood in the Xiliens' way: Godzilla. 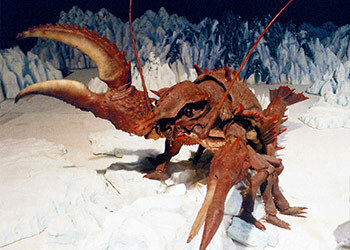 The sea monster was equipped with two massive, scissor-like claws called the Crisis Scissors. These weapons were of differing size, with a more massive, 20 meter long claw found on the monster's right hand. On the other hand, the beast had a slimmer, 15 meter long claw. 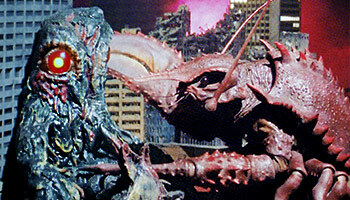 Ebirah wasn't seen using the claws against Godzilla, although inadvertently stabbed Hedorah in the eye with them when thrown by the King of the Monsters. The sea monster was portrayed by suit actor Toshihiro Ogura. Ebirah's Millennium version was designed by Nobuji Nishikawa. The beast's weapons were called the "Crisis Scissors" (クライシス・シザース - Kuraishisu Shizasu), as noted in sources like the Godzilla: Toho Monster Picture Book (ISBN: 4092800525). Ebirah's claws differed in size. The right hand claw was 20 meters in length while the left hand claw was 15 meters in length. These exact dimensions are noted in Godzilla: Final Wars: Super Complete Works (ISBN: 4091014984).